Brown cemetery sits today much as it has for the last seventy-five years. Where a Hinckley township family once laid its members to rest over a hundred years ago one can now see only ruins. Monuments erected on the farm by a grieving family to provide a lasting memorial to their loved ones have been vandalized, stolen, and neglected. Accounts from longtime township residents tell the tale of a private family plot whose stones have gradually disappeared over time; swallowed up by the growing brush, trees, and ravaging hands of time. The cemetery was still visible from the road as recently the 1970’s and even into the 1980’s. Nowadays one has to look a lot harder to find Brown cemetery. Brown cemetery is a private family cemetery situated on the north side of Bellus Rd. ; just west of Ridge Rd. (State Route 94); on the property at 1705 Bellus Rd. in Hinckley Township, Medina County, Ohio. You can’t see the cemetery from the road – even in the winter – but it isn’t far from the cars that drive by it everyday. The cemetery is 0.2 acres in size – not very big – but contains no less than fourteen burials. It contains burials of the Brown, Oviatt, Parker, and Babcock families. The earliest burial documented is that of George Babcock, a son of David and Jerusha Babcock, who died in 1842. Ida E. Brown was the last burial known to be made; that being in August of 1869. The cemetery is completely surrounded by woods. 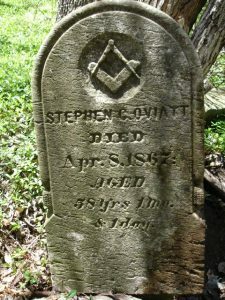 A large, heavy headstone for Stephen Oviatt bears the mason’s symbol but also lies toppled over with no sign of its foundation. It is in nice condition but only because of its size. The stone for Mary Oviatt is thinner, more fragile, and crumbling. It lays under brush and can’t even be moved without breaking it more. The headstone for a Brown family infant stands with its top broken off. A footstone reading S.M.O. lays under some more brush. A headstone for a teenage girl from the Oviatt family sits alone; separated by a wall of tangled vines. Numerous pieces of headstones – mostly their bases – lay scattered. The spire of an obelisk lays toppled – perhaps the top of the monument for Charles D. Brown and his family which once stood in the cemetery. More headstones and their pieces are here; no doubt concealed by the leaves, brush, and vines that now claim this cemetery as their domain. Given the size of the trees in the cemetery one can easily believe that it hasn’t been maintained in almost a century. While some headstones have been removed by the neighboring property owner (more on that later) no other headstone thefts are definitively known. The Medina County Cemetery Preservation Society (MCCPS) is aware of one headstone that came from the Brown cemetery that is now hiding safely at another Medina County cemetery – how it got there is not clear. The information about who is buried in Brown cemetery is based on limited documentation collected over the years. The 1897 Medina County Atlas shows the cemetery clearly marked as a `Private Cemetery’. The Ohio Genealogical Society mentions the cemetery in its first edition – compiled in the late 1970’s – and describes it as `not maintained’. When the Medina County Genealogical Society compiled its tombstone inscriptions book back in the early 1980’s, a member of that effort was able to record the information off of the headstones that he could see at the time. The controversy surrounding Brown cemetery no longer centers around whether anyone cares. Many have expressed a genuine interest in seeing new life breathed into the old cemetery; to see it cleaned up and restored to a place where one can pay their respects to those who are buried there. They wish to see it restored to a community asset – not a shameful secret. The many supporters of this effort have included the Medina County Cemetery Preservation Society, the Hinckley Historical Society, the Hinckley township trustees, the Wayne County Cemetery Preservation Society, members of the Hinckley area and surrounding communities, and – last but not least – descendents of those families buried there. So why does this cemetery still sit in ruins? Ownership. While the wording of the deed, as expressed above, is clear on the intentions of the families who established the cemetery, somehow along the way the legal system let those intentions slip aside. The cemetery was set aside from any future land transactions in 1863 but, in the sales that followed, the mention of the cemetery gradually disappeared. This first happened in April 1909 when the property was sold to a Halbert Cartwright and makes no mention of the cemetery in the transaction. Those who bought the land around the cemetery, when inspecting their deed, wouldn’t find anything to tell them that the cemetery wasn’t theirs. While the cemetery wasn’t included in the deal – literally or in words – in neglecting to mention it, its fate as a separate land entity was stolen away. Do a check of the Medina County tax map records and you will not find the Brown cemetery anywhere, but it’s there; blurred together as a perceived piece of the surrounding land parcel (Permanent Parcel # 016-03C-10-008). We know what the cemetery parcel that is Brown cemetery looks like. Surveyor Nate Orchard was kind enough to sketch the cemetery boundaries on a tax map – using the description from the deed. It shows a parcel of land that is directly next to the road – with almost one hundred feet of frontage; meaning that no one’s property would have to be crossed to reach the cemetery. But what do you do when the surrounding property owner thinks that the cemetery property belongs to him? Therein lies the problem. Township resident Bill Horton owns the neighboring property that surrounds the Brown cemetery. He has been a township trustee and served his community as fire chief. His community service ends when it comes to cemeteries. When I contacted Horton in 1998 to inquire about the cemetery, he wasn’t open to anyone coming to the site. While he was willing to answer basic questions about it, Horton made it clear that he felt the cemetery was “just a pile of stones” and “nothing to see”. I asked for even one visit so that I might see for myself; to photograph the site and any headstones for my research. Horton never budged: “No.” So far as known, Horton has only ever allowed two visits in the last 30 years. Ed Brown, a descendent of those buried there, was allowed to visit the site during the 1980’s and was even offered any headstones that he might want to take. Mr. Brown turned down the offer but did take photographs of several stones that Horton had removed from the cemetery and had up by his garage. These photographs – copies of which are in the hands of MCCPS – are now important evidence of headstones that might now be lost forever. Allegedly, Horton still has these headstones somewhere on the property. Why did he remove them? He has claimed he removed them to protect them. In fact, that is one of the reasons he wants the cemetery to remain in its deteriorated condition: a cemetery that isn’t visible and already destroyed can’t attract vandals or visitors. The other allowed visit was by former Hinckley township sexton and current curator of the Hinckley Historical Society, Sue Batke. She requested permission from Horton in 2002 to visit the site for research purposes and was allowed in. She asked me to accompany her on the visit and we were shocked to find even less there than was recorded back in the early 1980’s. Several headstones copied years ago weren’t to be located but given the site’s condition they could have been right under our feet. The search did yield one additional headstone not previously recorded and a chance to obtain a GPS reading of the site. A couple of years later, township resident Jackie Brown – another Brown descendent – discovered the sad state of affairs regarding her ancestors’ burial plot and decided to pursue the issue. She retained legal counsel, attorney C. Nevada Johnson, to examine her options and even brought the issue before the Hinckley township trustees at one of their meetings in December of 2004. Brown wanted the cemetery turned over to the township trustees so that it could be cleaned up and cared for in the future. Two of the trustees at the time, Ron Rhodes and Ron Majewski, stated that the township would be willing to maintain the cemetery but that the ownership issue would first need to be resolved. Mr. Horton was a Hinckley township trustee at the time and was certainly surprised when the issue which he had been avoiding was laid out in front of the entire township that evening. He was quoted as saying: “I would never restrict (Brown) or anyone in her family from visiting the graves, but she’s never asked before.” Perhaps, but he also stated that he has never denied access to the cemetery to those who have asked permission to go on his property. I know from experience that this is not true. Horton also stated that he didn’t do anything with the cemetery because he wanted other people to leave it alone. As quoted in the article covering this trustee meeting from the front page of the December 3, 2004 issue of the Gazette: “That’s why I’ve left things the way they are, to keep curiosity-seekers out of it,” What perfect sense that makes: allow a cemetery to fall into disrepair and rot away so that no one will want to come visit it – or bother poor Mr. Horton. Still, nothing has come of the issue as of yet – though not because of any lack of dedication by Jackie Brown. Mr. Horton has been given every opportunity to come out of this situation in some sort of positive light but he has maintained a hardline against all cemetery restoration efforts. Until a descendent of those buried there – someone with legal standing – can legally rescue their cemetery from Horton’s hands, the cemetery will sit in a state of decay. MCCPS has contacted Mr. Horton to make an attempt to even discuss the matter. He has ignored all communications. While he has stated publicly that he has always allowed family members to visit the site, his `generosity’ needs to be exposed for what it is. Allowing a family member to visit the Brown cemetery today is akin to allowing someone to view the rotting corpse of one of their family members – whose body he won’t release to them for proper burial. There is no honor in Mr. Horton’s actions – or inaction. He has remained uncooperative, unresponsive, and evasive with regards to any mention of this cemetery and has only talked about it when cornered (like at the township trustee meeting). It doesn’t have to be this way. The folks who want to clean up and restore the Brown cemetery don’t want anything from Mr. Horton. The cemetery belongs to the descendents of those buried there. Mr. Horton’s land wouldn’t have to be crossed or bothered. The cemetery would be cleared of brush and debris. Headstones would be repaired and replanted to mark the graves as they were intended. Maybe a nice fence and a sign could be erected to mark it. Hinckley township trustees have repeatedly stated that they would assume longterm care and maintenance of the cemetery if it can be legally deeded to them. The other three cemeteries that the township maintains – Beach, Maple Hill, and Ridge – are beautifully cared for. Mr. Horton has made himself the villain in this matter despite numerous attempts to allow him to bow out with some salvaged sense of honor. The headstones in his possession could be returned to the cemetery – no questions asked. Still, the Brown cemetery sits and we – those who want to save and restore it – will have to wait……for now.